We nearly titled this as ‘Stair-rested Development’… but whilst jokes about your Mom feature here regularly, that was one pun to far. Anyway, this is the stair truck from Arrested Development, recreated (rather wonderfully we might add) by TLCB regular, Master MOCer, and Brothers Bricker (boo!) Ralph Savelsberg aka Mad Physicist. Somewhat surprisingly, considering how excellent Ralph’s model is, it functions too, with the staircase neatly extending like your Dad does when watching Game of Thrones (jokes about your Dad are fine too…). There’s more to see of Ralph’s superb airport stair truck at his photostream – take a look at his extension via the link above. Flickr’s de-marco is becoming a regular here at The Lego Car Blog with his ever-growing garage of superb 5-wide Town vehicles. Here are no less than six of our favourites from his latest batch, all of which are available to view at de-marco’s photostream and many include building instructions too! As well as brilliant 5-wide cars and SUVs de-marco has built some of society’s more unusual vehicles, which are of course the ones we’re featuring here. Yes, we know we’re a bit odd. From a functioning skip lorry (top), to a fire engine (above left), freezer-truck (above right), and airport step truck (below) all de-marco’s builds are wonderfully creative, instantly recognisable and – most importantly – playable miniaturisations of their life-size counterparts. All of de-marco’s builds include a few neat working features and they’re also packed with the related paraphernalia associated with their task, including traffic cones and roadsigns in the rear of the highway maintenance truck (below left) and a hand-truck for delivering water-cooler bottles attached to the water delivery truck (below right). Which as everyone knows is a pointless tool, because water-carrying trucks are always annihilated by passing car chases. There’s more to see of each truck at de-marco’s Flickr photostream by clicking here, where you can also find links to building instructions so you can build these for yourself. Click the link above to take a look! It’s a bumper crop today at The Lego Car Blog! Previous bloggee de-marco has been very busy of late, building a plethora of 5-wide Town-style vehicles. Ranging from beautifully constructed classic pick-up trucks above, through a Humvee, an airport luggage tug, and even a Baywatch-esque coastguard vehicle (allowing us to get Pamela Anderson into the tags), de-marco’s small-scale creations are wonderfully life-like replicas of their real-world counterparts. You can view each of the 5-wide models featured here, plus lots more besides, courtesy of de-marco’s Flickr photostream. We’ll get you started with the Lada Niva pictured at the top of this post, which is our favourite – but then we’re a bit weird like that. Choose your own via the link above! 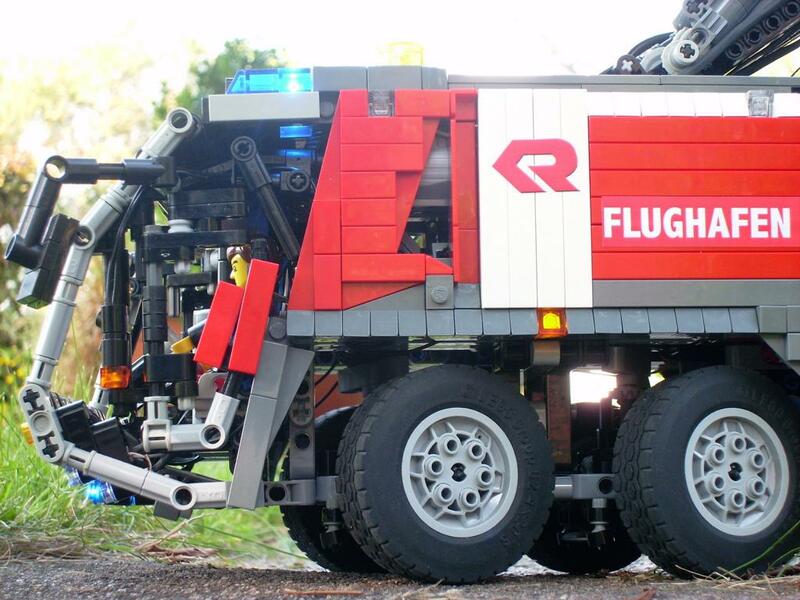 With the Elves still moping at the cancelation of the Top Gear TV show we’re turning to you for Lego models to feature. This one was suggested by a reader, and it’s a bit of an odd creation. At first glance it looks like a neat, but straightforward, airport tug. It’s got Power Functions remote control of course, but then so do half of the Technic creations we feature these days. But it’s far more than meets the eye. There are eight pneumatic cylinders – powered by compressor – that extend stabilising jacks under the chassis. Why? Because this is also a crane. And a snow plough. And a bull-dozer. Additional motors are used for power-take-offs (PTOs) at the front and rear, allowing a variety of different attachments to be connected using Thunderbirds-esque genius. Then there are another two pneumatic cylinders (taking the total to ten) that lift the two independent cabs up on arms so the driver/s can see over whatever it is they’ve attached to the front PTO. Oh, and twelve pairs of LED lights and another two motors for the winches. We’re not sure that such an incredibly able vehicle exists in real life, but if it did it would probably be the only vehicle that would ever be needed. For anything. Ever. It’s all been brilliantly engineered by previous bloggee Desert752, and you can see more details of how it all works on MOCpages.